ST. GEORGE – A minor earthquake was reported southeast of Beaver early Tuesday. 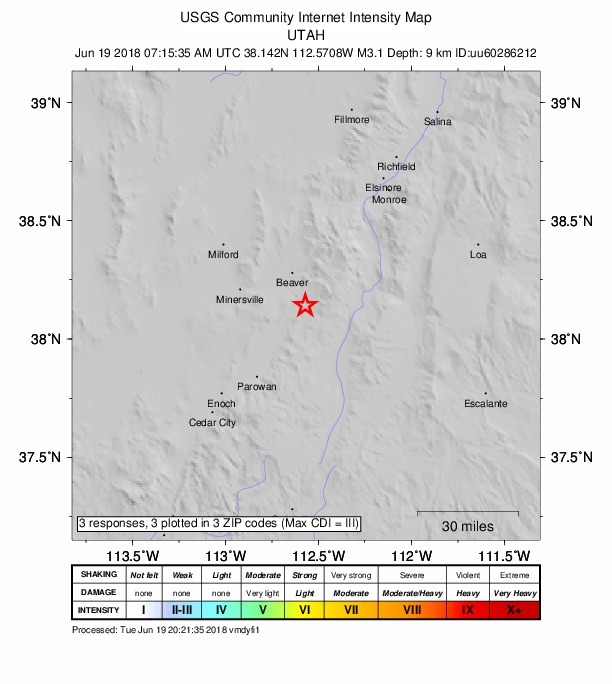 A University of Utah seismograph station recorded the 3.1 earthquake approximately 10 miles southeast of Beaver around 1:15 a.m., according the U.S. Geological Survey. No shaking or damage in the area of the earthquake was reported by the public, according the Beaver County Sheriff’s Office. Since the 3.1 quake was recorded, three smaller quakes, ranging from 1.0 to 2.4, were reported in the general area southeast of Beaver. These minor earthquakes are fairly common across Utah and largely go unnoticed.